Ultimate Hard Surface Self Adhesive Protector. Totally waterproof, protects against expensive to clean paint spillages on hard surfaces. Will not creep and wrinkle after application. Ideal for protecting against mess, dirt, staining, spillages and soiling that occurs during painting & Building work. Protects most hard surfaces including timber, ceramic tiles, laminate, vinyl, metal and stone. 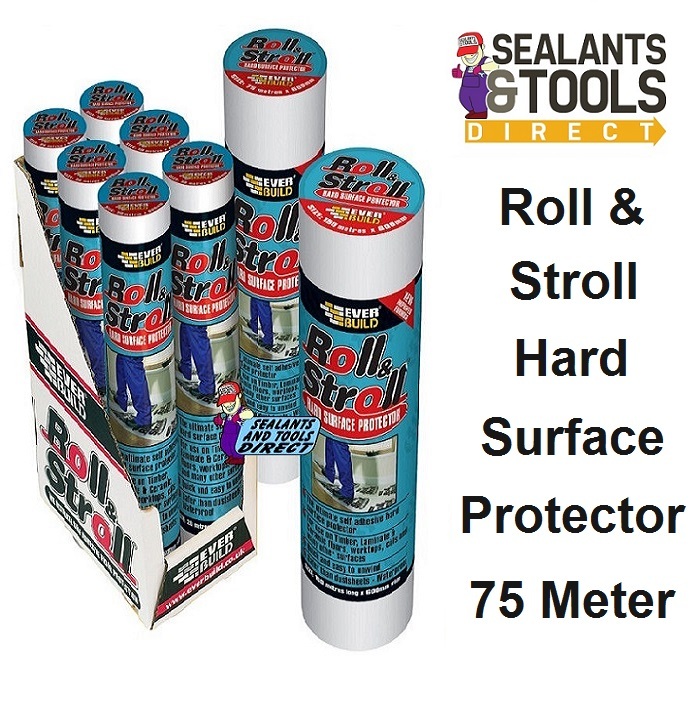 Roll & Stroll can also be used to protect worktops, window cills, doors, kitchen units and glass. Safer than dust sheets, no trip hazzard. This product is for application to hard surfaces, on carpets Use Roll and Stroll Carpet Protector. Remove after a maximum of 4 weeks to prevent a sticky residue being left. In heavily trafficked areas or where air temperature exceeds 220C, remove Roll & Stroll after 1 week maximum. Do not use underfloor heating whilst product is in situ. Ensure surfaces to which ROLL & STROLL is to be applied are clean sound, dust free and dry. Remove outer packaging from roll. Place roll on the floor facing the direction it is to be applied and unwind approx 12 inches (300mm) of material. Ensure the roll is stuck by smoothing out by either hand or foot. Simply push roll forward using hands or feet ensuring roll goes in a straight line. Smooth out with hands or feet as it unwinds. A very effective way of laying Roll and Stroll is to push the roll along with a soft broom/brush using the brush to smooth out and remove air bubbles as it unwinds. For application to worktops, glass etc roll and smooth out by hand until required length is reached. Carefully cut ROLL AND STROLL with a sharp knife or scissors, take care not to damage or scratch the covered surface.